Ancient Stones - Lothian - 011 Stones, Whiteadder Reservoir. A pile of small stones, mostly overgrown but with some stones still visible. The prehistoric relevance of this site is not known although it is marked on Explorer 345 as an antiquity. A. Thom investigated this location and describes an alignment of stones over 100m long, indicating the furthest point south of the full moon rise. Whiteadder Reservoir is on the B6355 between Gifford and Preston. 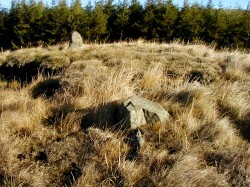 The stones can be found a few meters south of the cattle grid at the western end of the reservoir, on the hillside to the south of the road. On verge at side of road beside cattle grid. This was not at first a very exciting find and the stones appear to be the remains of small burial cairn, with a few stones poking through the grass. Alexander Thom suggests a 100m long alignment but no other stones remain to be seen at the location, perhaps due to the widening of the B6355. Measurements of the stones also indicated possible lunar and solstice alignments.